Solms-Braunfels was a partition of Solms, ruled by the House of Solms, and was raised to a Principality of the Holy Roman Empire in 1742. 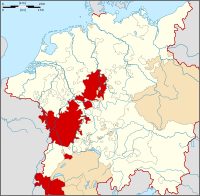 Solms-Braunfels was partitioned between: itself and Solms-Ottenstein in 1325; itself and Solms-Lich in 1409; and itself, Solms-Greifenstein and Solms-Hungen in 1592. Solms-Braunfels was mediatised to Austria, Hesse-Darmstadt, Prussia and Württemberg in 1806. The princely House of Solms-Braunfels became extinct with Georg Friedrich Victor in 1970. Braunfels Castle was inherited by the last Prince's son-in-law, the Count of Oppersdorff who changed the family name in 1969 to Oppersdorff-Solms-Braunfels. This page was last edited on 11 February 2019, at 02:56 (UTC).